Chimney liners are one of the most important safety features your chimney has.  Built to protect the masonry and surrounding building materials from the high heats created in the fireplace while also helping smoke and gas properly flow up and out of the chimney, it is extremely important that chimney liners remain undamaged in order to have a safe and effective chimney system. When they are built, most flues are lined with a tile liner. While chimney tile liners are extremely effective, they are also extremely difficult to repair. Most tiles – especially those in the middle of the flue – cannot be replaced without removing a portion of the surrounding chimney or walls. Likewise, the tiles may shift or the connecting mortar may be damaged, creating gaps in the liner. These gaps can allow heat and gases (such as carbon monoxide) from the fire to seep into your home, creating a serious fire and health hazard. Stainless steel chimney liners are built to last, and can be used with a wide variety of fuel sources (including wood, oil, gas or coal). This makes them an ideal choice for relining a chimney when the fuel source of the fireplace has changed or may change in the future. FireGuard resurfacing uses a unique product and process to repair gaps, cracks and mortar joints between flue tile liners. For some, the FireGuard resurfacing process may completely erase the need to reline the chimney. After being applied, the FireGuard ceramic forms an acid-, heat- and water-resistant surface that also reduces heat transfer. Guardian cast-in-place liners are a great way to safely and effectively reline and reinforce your entire chimney. Because cast-in-place liners have no seams, they are virtually impervious to damage and eliminate the risk of heat escaping or gas leaks. Unlike other chimney liners, Thermocrete spray-on ceramic liner does not reduce the diameter of the chimney flue. This versatile product can be used for the repair, restoration, or fuel source conversion of any fireplace . Choosing the right chimney liner for your home can be difficult. 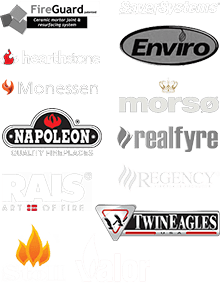 Don’t try to go it alone – rely on the help of the experts at Olde Towne Chimney & Fireplace Sales. Our highly trained staff can help you determine which chimney liner is the safest and most effective choice for your home and your chimney. Call us today at 812-284-0123 or click here to request an appointment online! Restoring your chimney to safe operation may be as simple as repairing or installing a new chimney crown. We can help you determine if you need this important chimney repair.